Surya Grahan or Solar Eclipse 2018 Dates and Time in India: As per the predicted set of events, the partial solar eclipse will be visible on August 11 over 3 hours and 30 minutes. Solar Eclipse 2018: The August 11 phenomenon, called a partial solar eclipse, will result in the Sun being visible as a crescent or as a disk with a hollow centre. Solar Eclipse 2018: In the early hours of August 11, a part of the Sun will appear to be covered by the Moon’s shadow. This celestial phenomenon called a partial solar eclipse, will result in the Sun being visible as a crescent or as a disk with a hollow centre. The nature and extent of this eclipse will vary from location to location, and those residing in India will be unable to see the Solar eclipse. 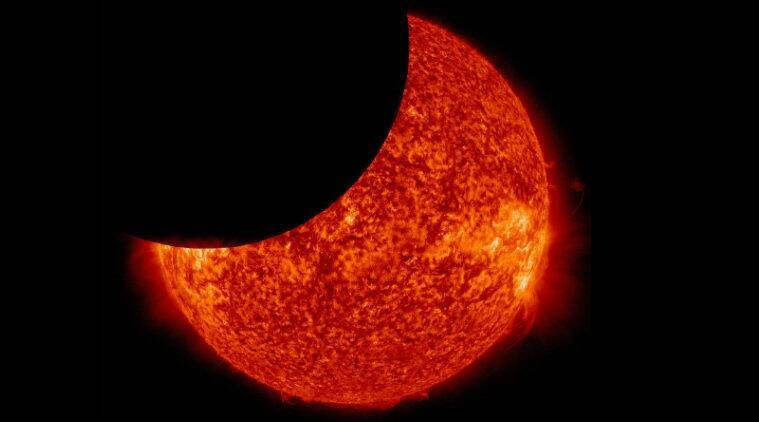 As per the predicted set of events, the partial solar eclipse will be visible between 9.02am GMT and 12.32pm GMT. As per Indian time, the eclipse will take place from around 1:32pm and 5:02pm. As per the path traced by NASA’s Goddard Space Flight Centre, the August 11 partial solar eclipse is expected to play out over northern Canada, north-eastern US, Greenland, Scandinavia, most of Siberia, and some parts of central Asia. Given the path of the eclipse, Indian observer will be able to see the event directly. At its height, this partial solar eclipse will be visible for the longest duration around the North Pole. As per NASA, 65 per cent of the 3-hour-30-minute show could be viewed from the Earth’s nothern-most point. Due to the limited range of influence, the partial solar eclipse will not be live streamed by an agency or observatory. So, those who will get a glimpse of the event will be people who reside in areas over which the eclipse will play out. For any type of solar eclipse, partial or total, undue radiation of ultraviolet and infrared light will be dispersed into space. Therefore, to avoid such exposure, viewers should take precautions to wear special solar eclipse glasses, or watch the event through a pinhole camera. 2 Solar Eclipse 2018: What is a partial solar eclipse, and how does it take place?